You never thought it was possible. Your little one is already one of the most huggable people on the planet. You have a hard time keeping yourself from cuddling with your child 24/7. 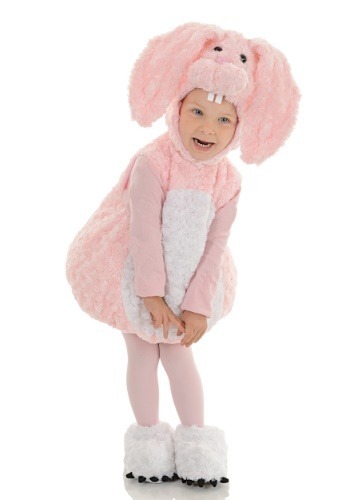 There couldn’t be any way to turn your kid into an even better cuddle buddy, but lo and behold, this utterly adorable Pink Bunny Bubble costume came along. Designed to maximize your child’s cuteness levels to unimaginable heights, this toddler costume comes with a jumpsuit that has an exterior made of uber-soft pink faux fur. We’re not kidding when we use the term uber-soft. The cozy material is a wonder to behold! The costume also comes with a matching headpiece that fits with a strap under the chin. It has a plush bunny face designed into the front, with a bright pink nose and a pair of goofy black eyes. Of course, big floppy rabbit ears hang down from each side for an endearing look that turns your little loved one into the most lovable critter on the planet. The final piece to this outfit is a pair of bunny paw style foot covers. Your child will love becoming a hopping little bunny rabbit! Not only is this a great look for a trick or treating trip on Halloween, but it makes for a great outfit to usher in the springtime season! Your child can even wear it as a lovable look for Easter time, so make sure to get it for your little one this spring.